I'm getting back in the mood to paint after being hit with the annual plague that goes around when fluctuating weather and bad allergies collide. Recently, I was contacted to work on a special project by Felipe, for Effin Cool Mini's Kickstarter, "Court of the Sultana", which runs through March 17, 2017. I wasn't sure what to expect, since the Kickstarter project hadn't launched yet. 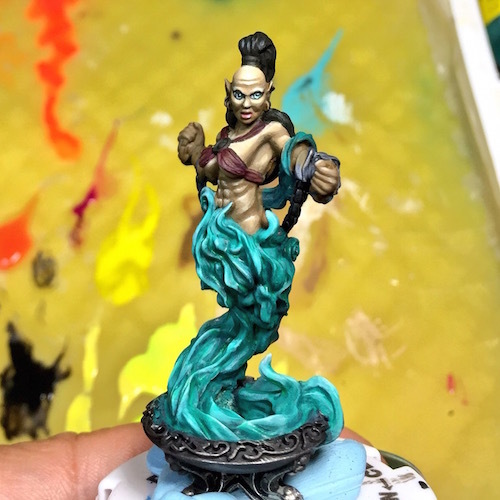 After they sent me 3D rendered images of the Djinn, a miniature from the Kickstarter, I agreed to paint her, as the sculpt looked like a fun challenge! Felipe was super-reasonable about the turnaround time, since I was going to be out of the country and navigating a death in the family. After returning home, knowing this mini was on my painting table motivated me to get painting again. 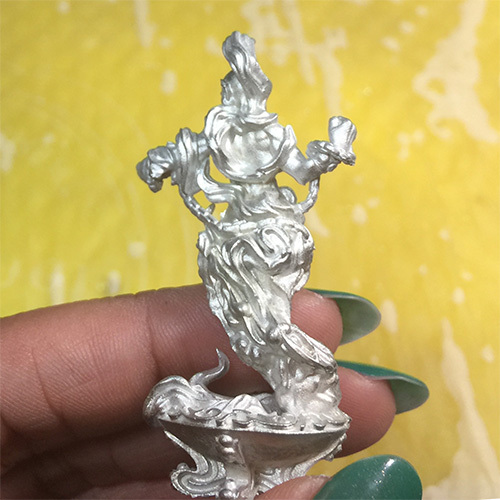 Felipe shipped the miniature quickly, and a few days later, the Kickstarter went live and I was able to see the full group of miniatures offered through the project. I was happy to see that they funded within 24 hours! I didn't have many mould lines to correct and after minimal sanding, I scrubbed her with an old toothbrush and dishsoap, and let her dry. 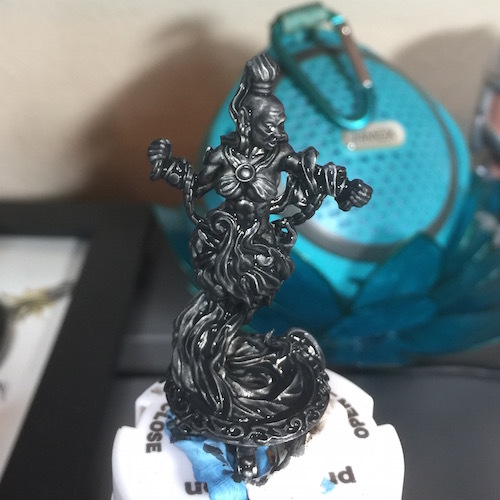 I then primed her with Reaper's brush on Black Primer and picked my basecoats. I wanted to start with a darker olive-brown skin tone and work my way up to a warm, white highlight. Given her androgynous musculature (especially around her hips and upper back), I wanted to be sure I was able to highlight each muscle group and add some high contrast to her skintone. I also did some research on painting fire since flames are supposed to be lighter closer to the combustion center, or hottest part, of the flame. One of the most valuable I found so far is on Laszlo Jakusovszky's blog "Hot Lead". I own both of his How To Paint DVDs and have benefitted from his experience and insight. While I know the center of the flames should be lighter than the tips, ethereal flames may have a little more room for "creative license", given that flames can look different depending on the level of oxygen available. 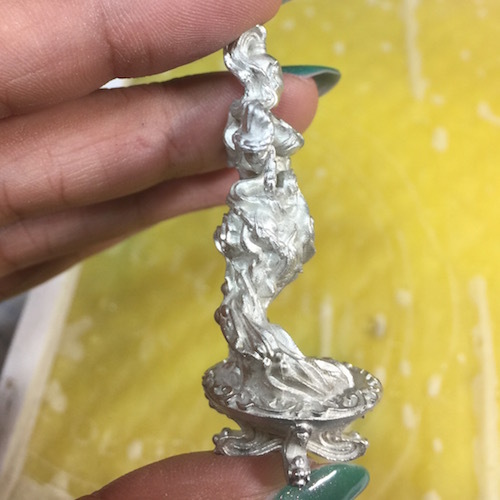 Since the flames on this mini originate in a brazier, I plan to bend the rules for a mix of both– I'll have the brightest part of the flame in the center of the brazier and at the tips of the flames closest to her skin– for a nice contrast that carries the eye up and around the mini. I'm just getting started, so we'll see where we end up! I'm about 30% done. 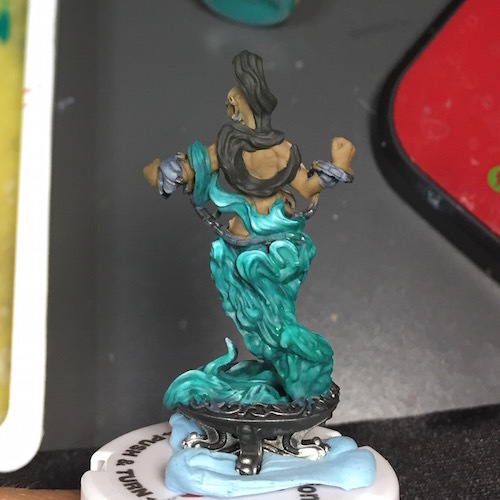 I'm fairly happy with how her skin is turning out, and I've yet to paint her hands, hair, brazier, chains, and flames (though I've at least chosen the flame colors/range of contrast). I'll be refining the blends around her stomach and hips, since they're a little too sharp right now. 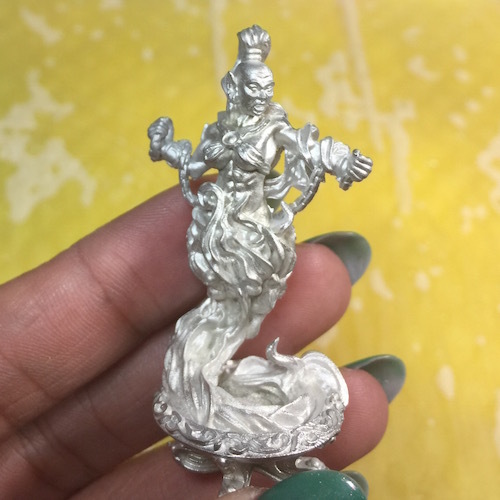 I'll also be considering what color to paint her hair– if I'm going to keep it black with grey highlights, or have it blend to another color, possibly with Object Source Lighting eerie blue-green coming from the flames. I'm happy with her eyes, and I painted them as exaggerated as I dared, matching the bright color of the flames. I hope to finish her in the next week– stay tuned and thanks for following along!